David Deberry II, Primerica Regional Vice President, presents at the weekly Monday money and business event at Primerica Lima location on 1700 Findlay Rd. Ste B.
LIMA — When Lima native David Deberry II graduated with a degree in Criminal Justice, he had never imagined that after switching careers he would ultimately become the Regional Vice President of Primerica, a national insurance and finance marketing company. After graduation, Deberry was determined to go on to law school with a mission to educate African Americans about law. However, after completing his undergraduate degree he began having second thoughts and became a behavioral substitute teacher and later a teacher’s aide for for special behavior students. “There were a lot of kids who were born into bad home situations, and I wanted to be the support that these children needed,” said Deberry. He also officiated Ohio High School Athletic Association basketball games and often traveled with Amateur Athletic Union circuit teams. During that time, he received a call from a representative from Primerica that changed his life. Once the representative had explained to him how he could receive free training and testing to become a financial advisor, work his way up to a broker, could work part time making commission off selling health, home, and life insurance and various other financial services without having to clock in, he realized that the opportunity was too good to pass up. In July 2011, he began working for the company as a part-time FA and in April 2014, after successfully moving up the ranks, he moved to Columbus to open his office. In March 2018, he was officially promoted to the Regional Vice President of Primerica. Deberry now has 35 agents and 150 clients with $30 million in life insurance sales. Now as the regional VP and a broker, he spends a significant amount of time traveling back and forth between his office in Columbus and his one on 1700 Findlay Road, Suite B in Lima educating the community about the importance of money and business. 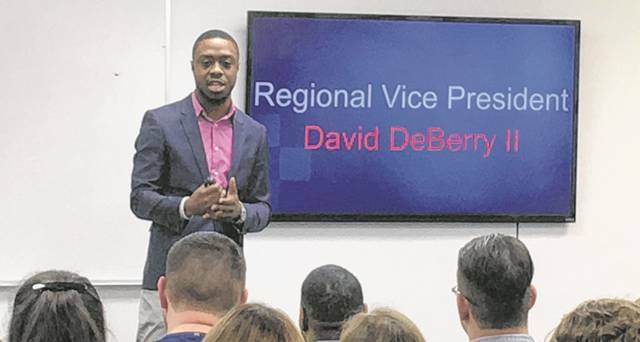 https://www.limaohio.com/wp-content/uploads/sites/54/2018/05/web1_David-Deberry.jpgDavid Deberry II, Primerica Regional Vice President, presents at the weekly Monday money and business event at Primerica Lima location on 1700 Findlay Rd. Ste B.